A group of renowned architects and critics will explore speculative work, designs that require a willing suspension of disbelief and projects that are not straightforward manifestation as buildings, for three days at Cornell, Oct. 30-Nov. 1. 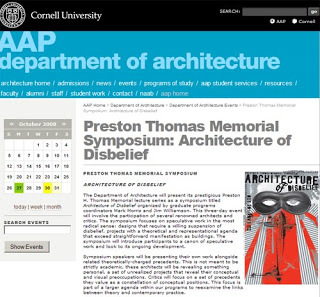 The symposium, Architecture of Disbelief, sponsored by Preston H. Thomas Memorial Lecture Series in the Department of Architecture, will introduce participants to a canon of speculative work and look to its ongoing development. The symposium kicks off with a keynote address by Neil Spiller, vice dean and professor of architecture and digital theory at London's Bartlett School. Lebbeus Woods, co-founder of the Research Institute for Experimental Architecture and a professor at Cooper Union, will present a lecture, "Against Design," The symposium session Saturday includes an address by Jeffrey Kipnis. 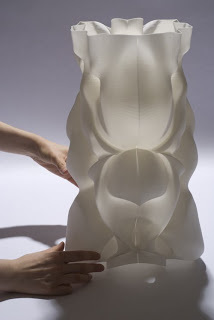 Neri Oxman will present her recent work and research entitled: Voodoo Code. A publication is planned to document the event and accompanying exhibition in Sibley Hall's Hartell Gallery.